My first 2 ultrasounds there was only one, and on 1/20/09 the lady put the ultrasound wand on my belly and just as soon as it hit, she said "We do know already that there are two in here right..." WHAT no I didnt know and what a way to tell someone lol...anyway I will be 10 weeks on Thursday we are really close if you want to talk....or anyone else reading this e-mail me at mamaof_003@yahoo.com I dont know how i came across this site and dont know if i will be able to find my way back :o) good luck to you and all! WoW! same thing here 12/30/08 went for ultrasound to help figure out due date. What a surprise two sacs two heartbeat TWO BABIES!! also 6weeks and 6 days. 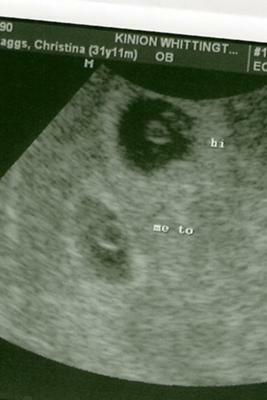 Went for ultra sound exactly one week before on 12/22/08 and only saw one sac! So we are still in shock but very happy A little nervous because we have two boys at home 5 & 3!!! we are going to be busy!! Congrats to you we are heading down the same road :-) !! !